Submersible pumps are used for a wide range of applications. If you have a small pump around your property or a well pump it is probably a submersible pump. Submersible pumps are also common in sewage applications, raw water pumping applications, and to remove storm water from structures like parking garages. A submersible pump is a type of centrifugal pump that operates while completely submerged in the liquid it is pumping. A centrifugal pump combines the hydraulic design of an end-suction pump with a submersible motor. Submersible pumps are always of the close-coupled type – meaning that the impeller mounts directly on the end of the motor shaft, and the pump casing attaches directly to the motor frame. Submersible pump motors are designed with a water-cooled jacket. In most cases, the liquid being pumped is circulated around the motor to provide cooling for the motor. The internal parts of the motor are protected by a water-tight enclosure, which prevents the entry of any liquid. In addition, most larger submersible pumps include a sensor placed between the pump and motor which senses when the liquid has gotten past the motor seals and prevents the unit from further operation until repairs have been made. 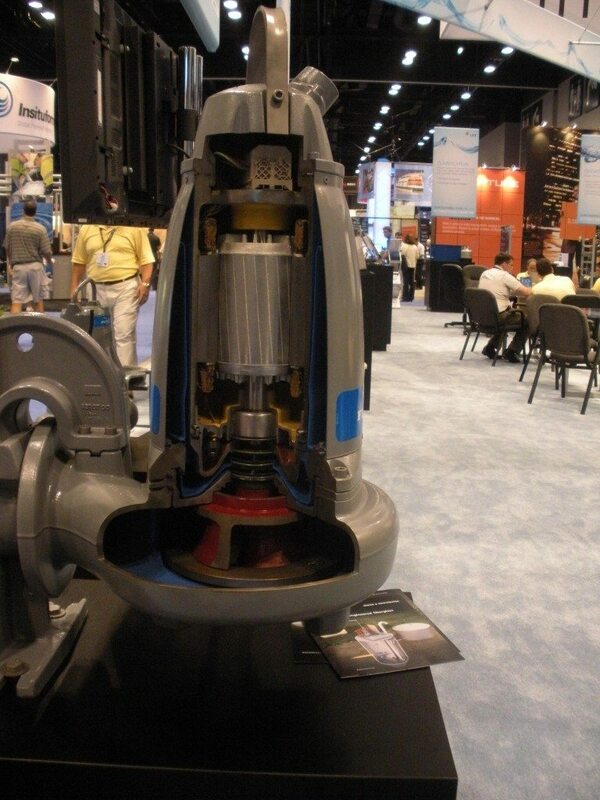 Submersible pumps are commonly used for sewage lift station applications. When water enters the wastewater system, in most cases it flows by gravity to a collection basin or sump. Submersible sewage pumps are then usually used to transfer the wastewater from the collection basin to a wastewater treatment plant. 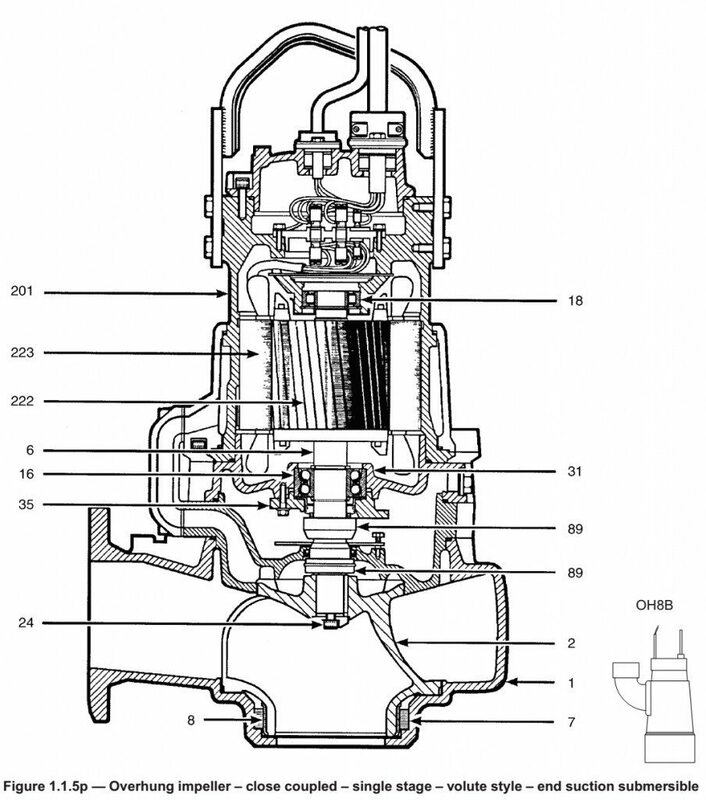 These pumps may be relatively small – as small as just a few horsepower – or they may be quite large, with large sewage pumps capable of being paired with motors rated for hundreds of horsepower. While submersible pumps are designed to be operated while submerged, in some applications the units are installed in a dry environment called a dry-pit. Since the motors are designed to be water-cooled, in a dry pit application an external source of water must be used to cool the motors. Another type of submersible sewage pump is called a grinder pump. These types of pumps are smaller units, typically just one or two horsepower. In addition, some grinder pumps are positive displacement pumps rather than being of centrifugal design. Grinder pumps are typically installed in residential areas, and used in sewage systems that do not operate by gravity. In these systems sewage must be ground up into a fine slurry before being pumped under pressure into the sewage collection system. Grinder pumps are installed in small basins in residential areas and perform this service. Sump pumps are used in locations expected to collect water such as in a small basin located in the mechanical room of a large facility, the bottom of a parking garage, or in a small basin in a residential basement. Sump pumps are also sometimes used for irrigation applications where water is drawn out of a lake or river and used for watering. While most submersible pumps designed for sewage pumping applications must be purchased from a specialty pump distributor, and carry a hefty price tag, you can buy a sump pump for residential use at your local hardware store at a very reasonable cost. Another type of submersible pump, submersible turbines, are also used for irrigation and well pump applications. You can read more about them on our vertical turbine page. 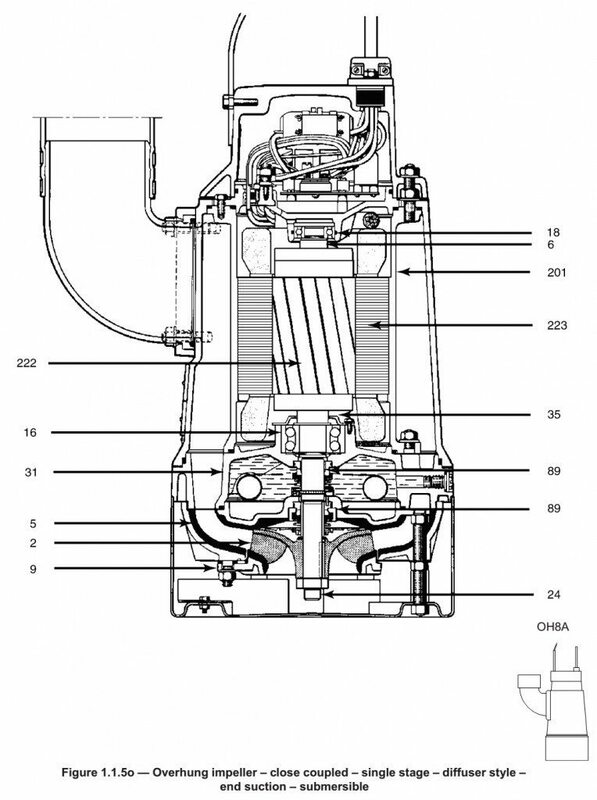 All pump diagrams are provided courtesy of the Hydraulic Institute, Parsippany, N.J., www.Pumps.org, and are used with permission.